Cornell physicists, working with Brookhaven National Lab, are constructing a new type of particle accelerator called CBETA at Cornell's Wilson Lab. This Energy Recovery Linac (ERL) is a test accelerator built with permanent magnets as well as electro magnets. How it works: CBETA will recirculate multiple beams of different energies around the accelerator at one time. The electrons will make four accelerating passes around the accelerator, while building up energy as they pass through a cryomodule with superconducting RF (SRF) accelerating structures. In four more passes, they will return to the superconducting cavities that accelerated them and return their energy back to these cavities - hence it is an Energy Recovery Linac (ERL). While this method conserves energy, it also creates beams that are tightly bound and are a factor of 1,000 times brighter than other sources. For more details, please contact the Cornell PI Prof. Georg Hoffstaetter. Although linear accelerators (Linac) can have superior beam densities when compared to large circular accelerators, they are exceedingly wasteful due to the beam being discarded after use and can therefore only have an extremely low current compared to ring accelerators. This means that the amount of data collected in one hour in a circular accelerator may take several years to collect in a linear accelerator. In an ERL, the energy is recovered, and the beam current can therefore be as large as in a circular accelerator while its beam density remains as large as in a Linac. The lynchpin of CBETA's design is to repeat the acceleration in a SRF cavities four times by recirculating multiple beams at four different energies. The beam with highest energy (150MeV) is to be used for experiments and is then decelerated in the same cavities four times to recapture the beam's energies into the SRF cavities. Reusing the same cavity multiple times significantly reduces the construction and operational costs of the accelerator. It also means that an accelerator which would span roughly a foot ball field can fit into a single experimental Hall at Cornell's Wilson Laboratory. However, beams of different energies require different amounts of bending, in the same way that it is hard for your car to navigate a sharp bend at 100 miles per hour. Traditional magnet designs are simply unable to keep different beams on the same "track". Instead, the CBETA design relies on cutting edge Fixed-Field Alternating Gradient (FFAG) magnets to contain all of the beams in a single 3 inch beam pipe. CBETA will be the first SRF ERL with more than one turn and it is also the first project in the history of accelerator physics to implement this new magnet technology in an Energy Recovery Linac. The task of creating and controlling eight beams of four different energies in a single accelerating structure sounds daunting. But by leveraging the pre-existing infrastructure and experience of Cornell with the power and expertise of Brookhaven National Laboratory, it will soon become a reality. Cornell University has prototyped technology essential for CBETA, including a DC gun and an SRF injector Linac with world-record current and normalized brightness in a bunch train, a high-current CW cryomodule for 70 MeV energy gain, a high-power beam stop, and several diagnostics tools for high-current and high-brightness beams, e.g. a beamline for measuring 6-D phase-space densities, a fast wire scanner for beam profiles, and beam loss diagnostics. All these now being used in the contrition of CBETA. Within the next several years, CBETA will develop into a powerhouse of accelerator physics and technology, and will be one of the most advanced on the planet (earth). When this prototype ERL is complete and expanded upon, it will be a critical resource to New York State and the nation, propelling high-power accelerator science, enabling applications of many particle accelerators, from biomedical advancement to basic physics and from computer-chip lithography to material science, driving economic development. The Photoinjector that creates and prepares high-current electron beams to be injected into the Main Linac Cryomodule (MLC). The photoinjector in turn consists of a laser system that illuminates a photo-emitter cathode to produce electrons within a high-current DC electron source. These electrons traverses an emittance-matching section to produce a high-brightness beam which is then sent thorough the high-power injector cryomodule (ICM) for acceleration to the ERL's injection energy. The Main Linac Cryomodule (MLC) that accelerates the beam through several passages and then decelerates the beam the same number of times to recapture its energy. The high-power Beam Stop where the electron beam is discarded after most of its energy has been recaptured. 4 Spreaders and 4 combiners with electro magnets that separate beams at 4 different energies after the MLC to match them into the FFAG return loop and then combine them again before re-entering the MLC. FFAG Magnets residing in the return loop. These cause very strong focusing so that beams with energies that differ by up to a factor 4 can be transported simultaneously. Dominant funding for CBETA comes from NYSERDA (2016 to 2020). Important for this agency is that CBETA emphasizes energy savings by its use of energy recovery technology, its application of permanent magnets, and its particle acceleration by superconducting structures. 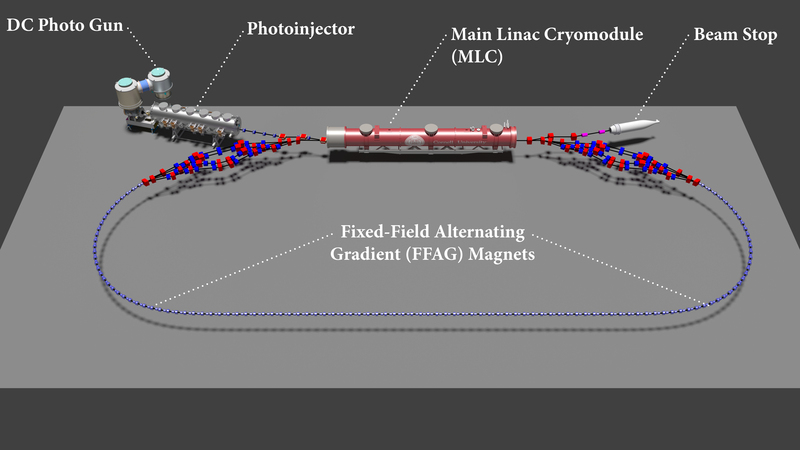 Previous funding came from the NSF (2005 - 2015) for the development of the complete accelerator chain from the source to the main ERL accelerating module, from DOE supporting developments for the LCLS (2014-2015), and from the industrial company ASML (2015-2016) for applications in computer chip lithography.